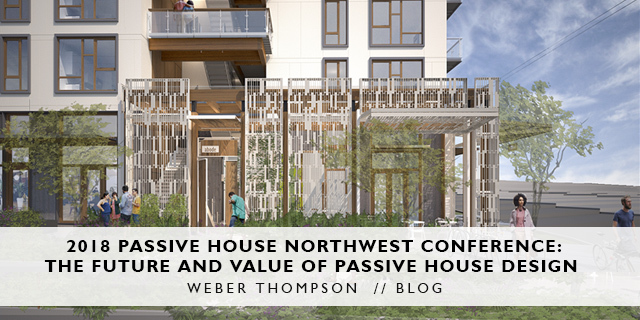 I recently had the opportunity to represent Weber Thompson at Passive House Northwest’s (PHnw) 9th Annual Conference in Olympia, WA. PHnw is a community of architects, builders, developers and policymakers who champion passive house construction, an uber-energy efficient means of building. Weber Thompson was a proud sponsor of a policy roundtable discussion on Passive House for Affordable Housing and Equity. What is Passive House Design/Standard? Passive house construction refers to a design methodology that relies on passive solar building design and an air-tight building envelope to achieve highly energy efficient, quiet and comfortable buildings. Passive house certified buildings consume an impressive 60-85% less energy than comparable code-compliant buildings . While Passive House strategies have been embraced by European builders for many years, the PHIUS+ 2015 Building Certification Standard is the first passive house standard applicable to North American construction and has inspired a new, rapidly growing Passive House movement in the United States. Any type of building can be certified, not just houses. More and more multifamily apartment buildings, office buildings and schools are going after certification. Weber Thompson is intimately familiar with the passive house methodology. We designed the Pike Passive project in Seattle – a fully designed and permitted 42-unit apartment building in Capitol Hill for 13Pike LLC, a development partnership between Barrientos + RYAN and Cascade Built. When constructed, it will be among the first Passive House Certified mixed-use, multifamily projects in the country. To further refine our understanding of the strategies utilized on this project and to broaden our knowledge of passive house detailing, my colleague Aaron Swain and I took part in a rigorous training to become Certified Passive House Professionals in 2017. The value of the Passive House methodology is that it sets a proven path to achieve ambitious, yet obtainable, energy efficiency goals. The energy performance value of Passive House strategies is less about purchasing the highest end assemblies, systems or components, but lies in an added level of care for the coordination and study of the performance of each construction detail. Because PHIUS+ 2015 and commercial passive house construction is still relatively new to the Pacific Northwest, forums like the PHnw conference provide a valuable opportunity to discuss the specific strategies and challenges of other notable multifamily projects pursuing passive house certification in our region. Recent multifamily projects in the Pacific Northwest that are currently targeting PHIUS+ certification include Pax Futura (Columbia City, Seattle), Brixton Flats (Vancouver, BC), The Heights (Vancouver), and of course Weber Thompson’s own Pike Passive (Capitol Hill, Seattle). There are multiple benefits of Passive House construction. In addition to the obvious environmental benefits to ultra-energy efficient design, passive house projects are also very comfortable spaces. 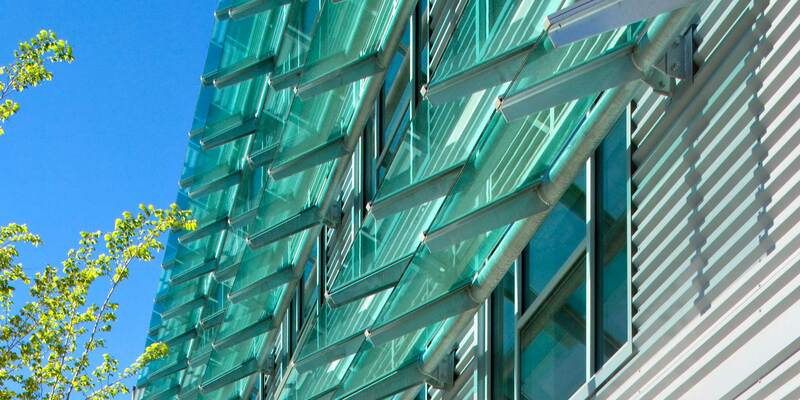 Strategically placed windows, combined with a robust building envelope, limits indoor temperature fluctuations. All interior surfaces are designed be within five degrees of the interior air temperature, meaning there are no cold spots and spaces are essentially draft free. Mechanical ventilation and operable windows provide a high indoor air quality. Market-rate multifamily Passive House construction is cost-effective. Several presenters spoke to the relatively low cost premium for multifamily passive house construction. They estimated a cost premium between 2-5%, and this getting lower as sub-contractors get more comfortable with the unique details. Multifamily units benefit from being densely packed, so the floor area to exterior wall ratio is low and super insulated walls are typically not necessary. Thus, the cost differential covers higher performing windows, lots of building tape to help maintain an air tight barrier, and an upgraded mechanical and ventilation system. The tight commercial subcontractor market is a major limiting factor on commercial/multi-family Passive House construction. Sloan Ritchie, owner of Cascade Built and experienced passive house contractor, presented the “Adventures in Developing and Construction Passive Apartments in a Construction Boom” where he spoke to the challenges of finding multifamily subcontractors. In the midst of a building boom, it is hard to find sub-contractors who are willing to take on something different. The means and methods related to constructing the continuous thermal envelope and continuous air barrier required by passive house differ from conventional construction. Passive House principals are the key to meeting our near-term energy reduction targets. Finally, the biggest takeaway from the conference was that passive house building principals are here to stay. Envelope-centric efficiency measures will be soon be the primary path to energy code compliance. I sat in on two panel presentations about local energy policy: Zac Semke, architect with NK Architects, led a panel discussion on a new zero-net carbon building alliance called Shift Zero; and Marty Kooistra, the executive director at the Housing Development Consortium led a policy roundtable discussion with seven local policy makers. The tone of both panel discussions was that climate policy was getting desperate. The City of Seattle and the State of Washington have ambitious energy reduction targets that are not currently being met. Envelope improvements and energy performance metrics are going to be the way of the near future. With little federal backing, and serious consequences to not meeting energy reduction targets, the Washington State and Seattle Energy Codes are buckling down to meet more ambitious energy targets. While past iterations of the energy code have made building certifications optional (such as Passive House, Living Building Challenge, or LEED) and offered incentives to meet these targets, the energy reductions in upcoming code cycles will be mandatory. Current federal regulations limit capping the efficiency on HVAC equipment or outlawing specific types of fuel; for this reason the upcoming versions of the energy codes will meet their increased efficiency targets by requiring increased envelope performance. While Passive House certification will not specifically be a route to code compliance, though it can earn you some zoning incentives in Seattle, the passive house principals will be the future of energy code compliance. This underscores the importance of understanding concepts such as continuous insulation, thermal breaks, a tight air barrier, and passive solar design; which are the principal characteristics of Passive House design. I am incredibly inspired by the work being done in this field. It was a pleasure to see the good design work, big thinking and innovative technologies that will shape our sustainable future. Emily Doe AIA, CPHC, LEED AP BD+C, is an Associate and Project Architect at Weber Thompson with over 10 years experience. She brings a dynamic and detail oriented work method to all phases of design from pre-design through construction administration. She also uses her skills on a variety of project types including mixed-use and multi-family.